In this article, I'll be discussing Magic 2015's cards that will impact Cube by color. Since there are a lot of cards that are analogues to other cards, I'll be including a table of them and the archetypes in which they'll play as well as some in-depth discussion. Check out the end for a cheat sheet covering even more cards! Ajani Steadfast – I'd be remiss if I didn't talk about the newest incarnation of Ajani, and Steadfast is a very good one. Ajani Goldmane had one ability, and it was amazing. Steadfast's middle is a downgrade at the cost of having a good +1, which has been solid at letting creatures punch through while stabilizing, allowing Steadfast to work well with both token armies and large, singular creatures. 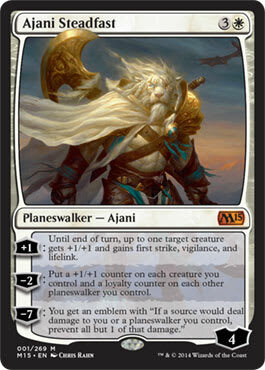 One point is that Ajani's -2 can lead to some feel-bad moments since it can make Planeswalkers ultimate very quickly due to the tightness in loyalty of Planeswalkers, such as Koth of the Hammer. There's room for both in a Cube, as both work well toward helping similar decks in an effective manner, but if you’re following Planeswalker restrictions, Ajani Goldmane is better. Hushwing Gryff – When looking at most of the creatures in Cube, they're either efficient attackers or ones with powerful enters-the-battlefield triggers, a la Shriekmaw, and as we've learned with Thalia, Guardian of Thraben, putting a ho-hum ability on a creature can make it Cube-worthy. Don't fear its symmetry; its flash can help it act as a Counterspell-esque card for opposing enters-the-battlefield-triggering creatures, and it can reward drafters for building decks that take advantage of Cube creatures' strengths. Spirit Bonds – This suffers from what disappointed me in Mentor of the Meek: When it's fueled by creatures, it's amazing, but it’s abysmal when it can't be fueled, and when a deck that wants to use it is behind, it's typically because it isn't drawing threats and pressuring the opponent. Soul of Theros – High-mana-cost finishers have long been held to the standard of the Vindicate test, where high-cost creatures need to give some form of return if killed by instant- or sorcery-speed removal due to the low mana cost of available removal in the format. One pitfall is that it tends to cut the conversation by assuming that the game ends after the removal is spent, where that isn't necessarily the case, as we've found through cards such as Consecrated Sphinx and Aetherling. The best Soul creatures tend to require killing quickly since their activated abilities can take over a game, and even if they die, the threat of activation—as Marshall Sutcliffe puts it in these articles—is big with Soul of Theros, as it can make blocking very awkward for an opponent, even if its ability isn’t used. Synopsis: There are a few solid role-players with Ajani Steadfast, Hushwing Gryff, and Soul of Theros, but there’s nothing too earth-shaking. Chasm Skulker – This is a better Lorescale Coatl with some built-in protection. Initial testing has shown that it isn't terribly difficult to become big, even outside of dream scenarios with draw-threes, draw-sevens, and the like, as blue decks naturally tend to have draw spells. That said, in smaller Cubes, it probably won't last for very long. Blue's Cube roster is comprised of “mistakes” and cards that break the mold, and Chasm Skulker may have a hard time competing with these. Jace, the Living Guildpact – This is the worst Jace and not a bad card at all, but it suffers by being in a tough slot for Cube cards at 4 mana since a lot of its value is based on its high loyalty and ability to bounce a permanent rather than pure card advantage, which a lot of Cube 4-mana cards in blue do. Synopsis and Impact: There are a few solid role-players, but Magic 2015's blue additions are weak riffs on cards that aren’t included in many Cubes anyway, such as Void Snare and Quickling. Ob Nixilis, Unshackled and Soul of Innistrad – Both suffer from being low-impact when they enter the battlefield, and they require a few too many hoops to leap through to properly generate value out of them. 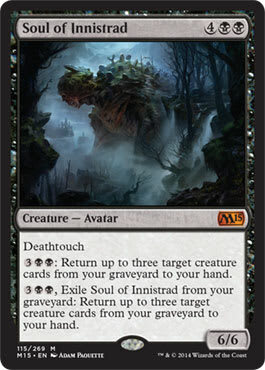 Soul of Innistrad's ability is very difficult to get multiple uses out of, despite how powerful it can be when that happens (it's rare), and Ob Nixilis has a weaker Stranglehold and a pretty weak body. There are better 6-cost cards, such as Massacre Wurm, which already don't see a lot of play. These finishers have little chance of making it into Cube. Goblin Rabblemaster – Despite being similar to a card that hardly sees Cube play, Goblin Rabblemaster is a much better card than Goblin Assault was since it provides a creature immediately and can attack for a ton of damage, even outside of gold-fishing scenarios and even without another Goblin in the deck. One thing I've noticed is that it tends to be awful against big lifelinkers and cards like Hornet Nest, but it's great everywhere else. It's interesting since red is such an attacking-focused color and has a lot of strong attackers at 1, 2, and 4 mana, but not so much at 3 mana, where most of its creatures are utility creatures, such as Squee, Goblin Nabob and Manic Vandal, so the Rabblemaster is a nice, welcome addition to help supplement the red aggro archetypes. Borderland Marauder and Altac Bloodseeker – Both of these are included in the same discussion since they fill similar roles: attacking for a lot of damage for 2 mana. Borderland Marauder may be the more consistent of the two and may therefore stay in Cube longer, as we've learned from morbid cards that having an opponent's creatures die isn't as easy as we'd think—but the ceiling on the Bloodseeker is very high. Thankfully, we have a lot more red 2-drops than we had a few years ago, so there's room to play with. Generator Servant – Despite being another 2-mana 2/1, this isn't really a card for red aggressive decks—unless in a pinch. We've learned from Dack's Duplicate that haste is huge on a big thing, and the Servant can power out some big plays with giant monsters while helping to cast mana rocks or other things if need be. 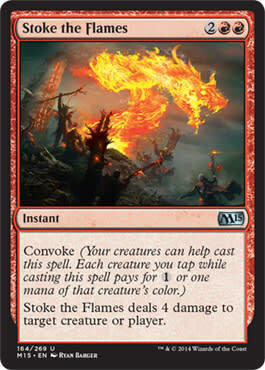 One strike against it is that it can foreshadow a big spell if the opponent does have the removal or countermagic for it since it opens you up for a two-for-one. But, as we've learned from cards like Master of Waves, the opponent doesn't always have it. Soul of Shandalar – Red has a bit of an awkward situation with it having Wildfire and Burning of Xinye; yet, its big-mana finishers, Inferno Titan aside, just aren't great. Soul of Shandalar is next in the hope of cards to fill that void; in testing, I've found that it can be pretty annoying to have in play since its ability gives inevitability that can end the game, unlike Souls such as Soul of Zendikar. Punish the Enemy isn't great, but it's nice when it's on a 6/6 for 6. However, its initial board impact can be low, which may make it so that if there's a Thundermaw Hellkite–caliber 6-drop in Khans of Tarkir block, Soul of Shandalar will leave most Cubes that have it. Aggressive Mining – This is an interesting card for combo decks, but not so much for aggressive decks since they've already had a ton of great 4-mana cards, such as Hero of Oxid Ridge and Flametongue Kavu. Kurkesh, Onakke Ancient – As most artifacts in Cube tend to be either Equipment or mana rocks, a lot of Kurkesh's value drops since both are nombos with Kurkesh. For comparison, the artifact-heavy Holiday 2013 iteration of the Magic Online Cube has seventy colorless artifacts, and only fifteen work with it, limiting its value severely. Synopsis and Impact: Red is pretty big, and it’s the winner in M15. There are a few really good 2-mana guys, and there’s one of the few good 3-mana creatures for attacking. Hornet Nest – As you've probably seen from playing in prerelease events, Hornet Nest is an innocuous card that plays better than it looks since it can brick-wall attackers. 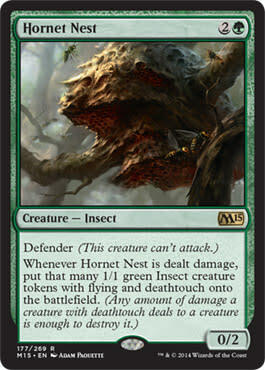 Say that an opponent's attacking the Hornet Nest player with two 2/2s. The player takes 2 and blocks with Hornet Nest, and the attackers are stonewalled, barring removal. Imagine this scenario if the creatures are any bigger, such as with a pair of 3/3s or 4/4s, a common scenario in the green midrange mirror. Attacking creates an incredibly poor scenario, as it gives a wall of deathtouchers. It's not as good against Doom Blades and Wraths, but the Vindicate test and the argument that, “It dies to Doom Blade,” apply to 6-drops, not 3-drops. It's also worse against control decks that are reliant on big, evasive creatures, nonred Wraths (although it's absurd with them), and Planeswalkers to win, but outside of those matchups (besides, isn't that what your sideboard is for? ), it's quite good in Cube. Nissa, Worldwaker – Nissa isn't just for mono-green ramp, but like Rofellos, Llanowar Emissary, it's a solid ramp card that goes along with what the archetype wants to do: make a bunch of mana and attack with big things that can trample over small defenders and tokens. Green does have a big stable of nice 5-drops with cards such as Thragtusk, Acidic Slime, and Garruk, Primal Hunter, but I've found that it stands toe-to-toe with them. Synopsis and Impact: Nissa adds yet another great 5-mana card, but overall impact is low to the color. 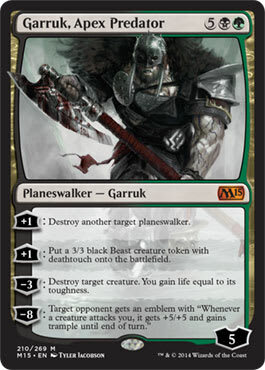 Garruk, Apex Predator – While it costs 7, which leads to the inevitable comparison to Karn Liberated—and Karn can kill things—they end up playing pretty differently as it compares to other 7-mana ramp targets such as Avenger of Zendikar and Sheoldred, Whispering One. Planeswalkers have always been difficult to evaluate, but I've been incredibly happy with it in testing since either of its kill abilities takes care of most things that could threaten it in Cube, and, most of the time, it kills whatever could kill it and spams 3/3 deathtouchers—or it spams 3/3 deathtouchers and acts as a Seal of Doom. It can't be reanimated or cheated into play (Eureka aside), but it's a very good reward for a Golgari, base-black, or base-green deck since it's incredibly easy to splash. It's difficult to say whether it's better or worse than Karn, but honestly, Karn isn't the only point of comparison for it, as Garruk is just a very good Golgari card. Soul of New Phyrexia and Scuttling Doom Engine – As discussed with Soul of Theros, Soul of New Phyrexia's power comes from its threat of activation in combat, making it difficult for an opponent to deal with it in combat without requiring a lot in terms of other forces to supplement it. The opponent can respond with instant-speed removal, but that's worst-case-scenario mentality at its core and ignores the impact that it has for the rest of the game by making removal and trades worse. Scuttling Doom Engine suffers from requiring the right set of circumstances to be good (things to evade and either an opposing Planeswalker or an opponent at low life), which has had it perform worse than Soul of New Phyrexia in Cube. That said, both of these additions are nice for ramp decks and are serviceable 6/6s for Wildfire decks. Scuttling Doom Engine is a bit outclassed by Soul of New Phyrexia. 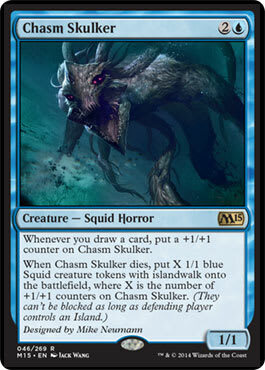 One thing that I've noticed is that most of the first-tier Cube cards in M15 are creatures and Planeswalkers. It's a trend that we've seen Magic go toward in the past few years, but it hasn't been as pronounced as in a set like this. May all of your opening packs contain Sol Rings!